Why doesn't Venus have any water? 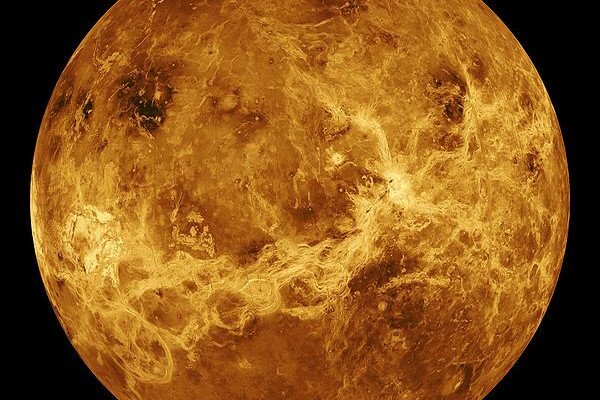 This month, scientists at the University of Tokyo have presented a compelling new model of planet formation that may explain why Earth's 'twin', Venus, has such a hellish environment. By most measures, Venus closely resembles Earth, and once lead to the hope that it too might host life. But Venusian probes in recent decades have told a different story. At roughly 460 degrees Celsius, Venus has the hottest surface temperature of any of the rocky planets, and more importantly for life, Venus lacks water, a fact that continues to puzzle planetary scientists. Maybe Venus had no water to begin with? But then how did Earth get its water? Or, perhaps Venus had liquid oceans in the past but, over time, extreme heat has slowly evaporated the water and strong solar winds have stripped the molecules from the planet? In a recent letter to Nature, Keiko Hamano and his team present a different theory: they believe that Earth and Venus represent two unique examples of rocky planet formation, where the crucial difference is their distance from the Sun. The research predicts that Earth-like planets will cool from an original molten state within a few million years and retain much of their initial water as oceans. On the other hand, the Venus-like planets might retain a largely-magma state for up to a 100 million years. Why the drastic difference in cooling times? It's all about energy balance. Hamano's model finds that, as a planet cools, a hot steam atmosphere is formed from the degassing molten surface. This atmosphere, full of carbon dioxide and water vapour, regulates heat loss such that there is a lower limit to how quickly the planet can cool (think greenhouse effect). But we have to also take into account the Sun's radiation as an external heat source. At a certain distance from the Sun, the heat coming in can balance the heat loss and prevent cooling. Interestingly, this distance is about the same distance as Venus from the Sun. Earth, being further away, has less heating from the Sun and can cool in a few million years rather than a hundred million. A quick cooling time is vital for retaining water on Earth-like planets. Once a cool, solid surface has formed, water oceans can develop and start absorbing carbon dioxide from the atmosphere. This reduces greenhouse heating and allows the planet to cool even faster. But it seems likely that Venus, with an extremely long cooling period, lost nearly all of its water vapour due to solar wind stripping before oceans ever have a chance to form. What's left is a lifeless, desiccated planet with extreme greenhouse heating. If only Venus had been a little bit further from the Sun, it too might have water. The results of this research should aid our understanding of exoplanet evolution. Once we know how hot an alien atmosphere is (due to the types of gaseous species detected), then we should be able to predict whether that planet is molten or solidified and, based on the distance from its star, whether it is the hell of Venus or haven of Earth. Previous Can imagination affect what you see? Next Is alcohol safe during pregnancy? Why do earthquakes occur far away from plate boundries? Is fluoride in drinking water harmful? I think you are really good help! You have helps me a lot thank you so much!